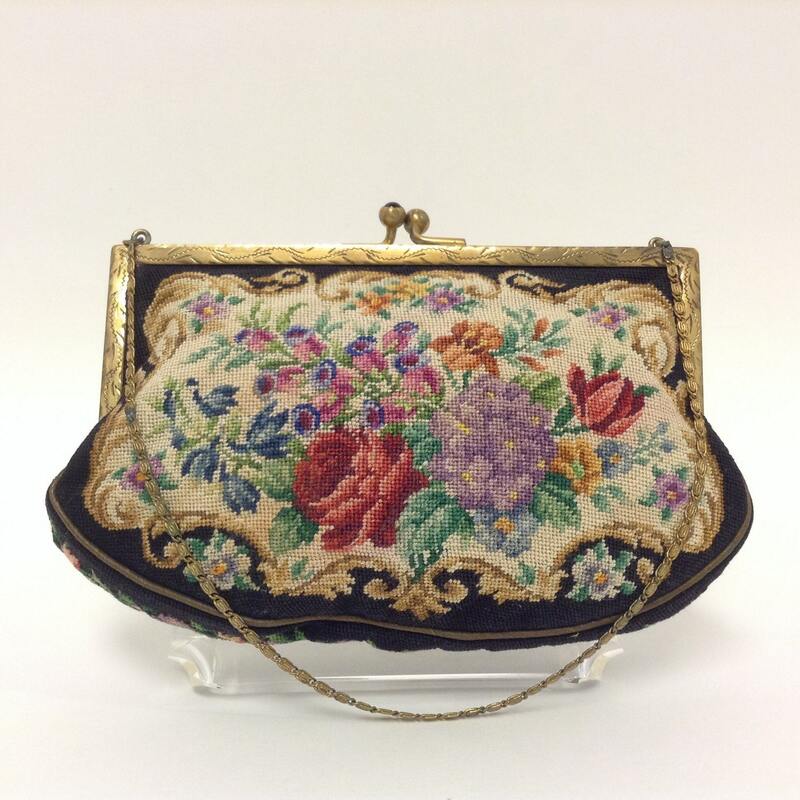 Charming vintage micro petit point evening purse with an all-over floral design in rich, radiant tones. The stitched design is the same on both sides - a full array of flowers and foliage in a cream center medallion against a jet-black background. The design highlights a larger center rose and bud in shades of red and pink along with a lavender and yellow chrysanthemum. The other flowers and foliage are in executed in shades of blue, green, purple, pink, gold, orange, brown, cream and grey. The floral-patterned border on the bottom is accented with cording giving the bag shape and definition. The interior is black satin with two rickrack-trimmed pockets. The purse measures approximately 4 1/2" tall by 6 5/8" wide by 1 3/4" deep. The brass frame is interesting in that there are two different designs on the frame – on one side, a geometric edging; on the other, etched free-form scrolls or waves (see photos one and three). The brass scroll chain measures 12 1/4" with a drop of 5 3/4" and does not fold in to make a clutch. The emerald-colored glass stone clasp works perfectly. This purse is in excellent condition with no tears, holes, fraying or odors. The interior is in very good condition with no stains just a few random white marks. There is some tarnish to the chain in a couple of spots and on the frame as well – nothing that could not be polished off if desired. This delicate, beautiful and romantic bag would be a fantastic addition to a collection of vintage clothing and accessories. Clear holder / stand is for display purposes and is not included.